The first thing people do before making the decision to purchase your products or services is to do some research to make sure your business is the kind of business worth their patronage. 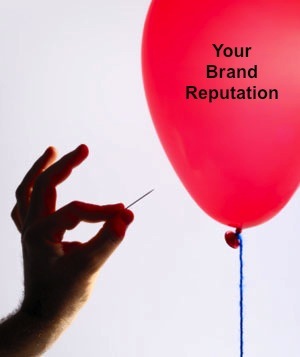 With this in mind, making sure due diligence is done to protect your brand reputation is crucial. Most companies will monitor their reputation by doing a Google search on their business name. What they will typically see is their own website and social media sites on the first page of their search. This of course is great, but taking the time to go through the pages of Google, at least the first four or five might uncover negative comments, articles or reviews that need to be addressed. When you find a negative review about your business or any other negative information, you may be able to address it and correct it and this should be done immediately. There may be some information that will not be able to be corrected, such as an unhappy customer that will not change their mind about your business, or worse yet, bad reviews from a disgruntled employee. When this happens, the best thing to do is take measure to bury the negative information as deep into the search rankings as possible. In order to bury negative information in the search engines, it is necessary to make sure that good information gets ranked higher. If all good information shows up on the first few pages of Google, chances are no one will continue to keep going through additional pages where less than wonderful information will show up. The way you do this is to make sure your business website pages are fully optimized for the search engines. Also, make sure that your social media sites are optimized for the search engines. Next, have happy customers post good reviews about you in the most popular review sites. For example, if you are a restaurant and someone marked you with one star and complained, ask happy customers to go to that review site and mark you at five stars and leave complementary comments. Most happy customers are willing to do this if asked, and if you encourage them with a discount or reward for their time and effort. When you have taken the time to make sure your business website and social media sites are search engine optimized and have good reviews that will counter the bad reviews, then the good news about your business will start to take up more of the search engine pages. This will protect your brand reputation and help potential customers know you are worth their patronage.